Palampur is the tea capital of northwest India. Set on the rising slopes of Kangra Valley before they merge with the Dhauladhar ranges. But tea is just one aspect that makes Palampur a special resort. Abundance of water and proximity to the mountains has endowed it with mild climate. The town has derived its name from the local word "pulum', meaning lots of water. Palampur was a part of the local Sikh kingdom and later on came under the British rule. The town of Palampur (1219 m) is situated in a idyllic valley priding itself with tea gardens, and hills covered with pine trees. The place enjoys a year-round pleasant climate and the pine scented air is said to have curative properties. The scenery presents a sublime and beautiful contrast- the valleys presents a picture of rural innocence and repose, while the hills are majestic. Overlooking this town are the majestic Dhauladhars, whose tops remain covered with snow for most of the year. This place is thronged tourists and is now being developed as a large tourist centre. A ropeway and an amusement park is also on proposed to be constructed. An Agricultural University and a Cenral Scientific Research Institute’s IHBT are pride of the town. Some tea factories are also coming up here. The Kangra valley is the Trigarta of old, where the Palampur town is situated. It was one of the leading hill states and was once a part of the Jalandhar kingdom. Palampur gets its name from Pulum which means abundant water. Countless streams and brooks crisscross the landscape and in their intricate mesh, hold tea gardens and rice paddies. The town of Palampur came into being when Dr. Jameson, Superintendent of Botanical Gardens, introduced the tea bush from Almora in 1849. The bush thrived and so did the town which became a focus of the European tea estate owners. Since then, the Kangra tea of Palampur has been known internationally. The first prime minister of independent India, Pandit Jawahar Lal Nehru visited Palampur in 1941 when it was still British India. There is a Nehru Chowk in Palampur to commemorate this event. Palampur, also known as the 'Tea Capital of North India', is a popular hill station because it is not only known for its scenic beauty but also for the beautiful temples and buildings built in the Colonial period. Here, a nature lover can enjoy a quiet stroll while feasting his eyes on the natural beauty and an outdoor lover with a taste for adventure can enjoy hand gliding and trekking during the holidays. It has something for people of all tastes, which makes it an ideal holiday resort for many. Palampur includes small places like Ghuggar, Aima, Ram chowk, Parour, Arla, Maranda, Rajpur, Bundla, Kandi, Kulani and Chandpur. Palampur Tourism - Get all information on Palampur tourist places and sightseeing tours. Our website helps you plan your next tour and gives you great ideas on what to do, where to eat, where to stay and when to go there. We give the best information from the web to give you precise, meaningful and useful travel guide for leading places to visit in India and from across the world. Our travel information on PALAMPUR tourist places, tourist attractions, major sightseeing, the best time to visit, the top places to visit in Palampur, the must-see things to see and do, maps, restaurants, hotels, nearby tourist destinations, local public information and more. 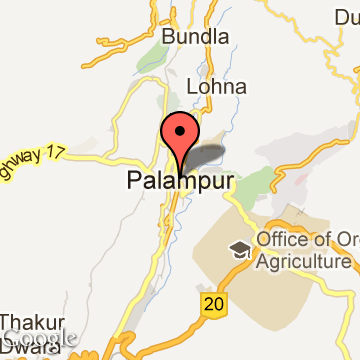 To start with check out information on how to reach Palampur.